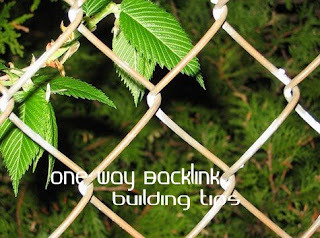 One way backlinks are very critical to any website success. The more one way backlinks pointing to your site, the more your Google Pagerank and the more amount of traffic you will get. This should also increase your sales,etc. 1. Try to write as much quality content as you can... that will encourage the readers to link to your site. The more useful, informative content you post, the more likely people are to link it. But, this method can take a while to really pay off because like all the new websites, you don't get much traffic. 2. Write quality articles and submit them to top article directories like ezinearticles and goarticles. The advantage in this is, you'll not only get a backlink from high pagerank directories, but also you'll find that your articles are used on other people's sites with a backlink to your site. 3. Participate in forums,discussion boards that are related to your website's niche and add a link to your site in the signature. Make sure that you write quality posts, don't spam. This will also help you get some decent traffic to your site. 4. There is absolutely nothing wrong to get a backlink from a related blog post you decide to comment on. This is one of the effective way of one way link building especially if you comment often on blogs. Comment on blogs related to your niche with a link back to your site as your signature.. and Again, make sure you never spam. 5. Submit your site link to major, well known web directories. Getting listed in directories related to your site not only bring you tons of targetted traffic, but will also improve your search engine rankings. Some of the popular directories to get listed in are DMOZ directory and Yahoo directory. You can submit your link to both paid and free directories and they worth your time. My first time here. Your posts are informative and in that regard can I ask you something? My blog, Housewife @ Work, cannot maintain its PR. If not PR3, its PR0. I suspected that it is maybe due to my webmaster that I indexed it with WWW. I changed it to NON-WWW and Google acknowledged it after 2 months. Right now it is still PR0 so I am considering a 301 redirect. Is that possible inside blogspot? Please help. Thank you in advance. These are great tips! Thanks for sharing them. I am already doing most of them - will try to get my site listed in the directories you've mentioned. It's hard to get listed in DMOZ, do you have any special tips to make it easier ? My blog art mirror shares my artworks with all for a free, yet I would like to see more visitors on my http://artmirror.blogspot.com/ Therefore I have read your article with great interest. I think it was the beneficial indeed. Thank you. I hope to get your feedback for to answer all your questions. When I started using google analytics my blog dropped from number one to infinity. Anyone else have this problem? I have one foot out the window. HELP! Hey thanks for the information..
Getting quality backlinks is the key to a skyrocketing website. These tips are great! In addition, you can also use blog commenting to strengthen your backlinking campaign. Glad I found this blog, you have some very useful info on here. Hey...great advise. I am currently using of your templates and LOVE IT. However, I can't figure out how to allow LINKS to my posts etc. I've allowed it through the blogger back end interface and it shows that its there, but it still doesn't show up on the website. Thank you for the great information. It will help a lot. We will come back often for more great tips. You are now in our blog favorite list so we get updates to the posts that you do. Thank you again. Thanks for the ideas. I just started my own blog the other day (The Money Soapbox) and I'm looking around the Internet to get ideas. I don't pretend to be any sort of "expert" (as let's face it - most so-called guru's are just pretending and are pretty new themselves!) - I just hope to have a very plain and honest interface. What works, what doesn't work, no thinly disguised ads. Great tips!!! im putting these tips into action! Speaking of adding relevant content to get backlinks.. you're evil mojo worked! Love the charcoal template. Thanks for the work to recode it! Thanks for the tips. I've been trying to do most of these, but not sure they're working, but will try some more. And thans from SolSisters for posting the link to your article. Come across your blog while searching. Building traffic to our site is an on going thing. Your ways are some the best and the cheapest to do it. I see what you mean good advice. thanks for your great ideas. I just came across your blog and found it extremely useful. I'm fairly new to all this stuff and I like things put into simple english where I can really understand it which you do. I'm going to check on the rest of your articles also; I'm sure they'll be just as useful. Nice tips ,thanks for all the advice. Ok, I agree with all of the things you wrote about but I have a question, I have a free blog on how to make money with your website or blog but I was wondering since it is hosted on blogger's hosting service do the backlinks still work in the same way or am I not helping myself at all, I realize that posting on forums etc. is good to get my blog out into the world but I'm lookin for SEO I am very knew at this and I'm very young so I'm trying to learn as much as I can and I don't want to spend all my time building backlinks if they are doing nothing for me so If you could leave me a comment on my blog helping me out I'd really appreciate that thanks so much, spencer. Nice list. Getting quality one way links has to be one of the heardest and most teduious jobs as a website owner. thanx! it helped me a lot!! It's never ending work! But worth it in the end! Good post. I would like to mention that web directories are not counted anymore by google. they have been removed from their guidelines. I would suggest blogger and such sites to get good back links from. great post ,about submitting your link to forums and blogs ,it's useful to submit those links to forums and blogs comments that supports do follow to ensure that your backlink will be counted and considered as quality backlink when google index them. Thanks for the articles on backlinks and search engine techniques. Good stuff. After a through reading your ideas on how to get one way backlink for website or blog owner I could not resist myself to comment here. The ideas here to get one way backlink that to from high PR site is quite awesome and I am hundred percent sure and agreed with you that all the techniques you have mentioned here in your article are always effective. It definitely take some time to so the result but quite good and work worthy. Thanks for these cool tips and I have added you in my bookmark to go through these tips once more. Thanks for advice. I recently got several backlinks by posting at www.PopGest.com. Now I will try the site you have suggested. Great post. This should really help me. Thanks so much. As a new web-designer, you have helped me understand the "tricks of the trade". This definately deserves a bookmark. I am trying to add link to us code in my blog but every time i add this it show my button instesd of code. is any body help to show how to make code so that it shows my code istead of button in box. Put that code in the < text area> tags.. Google it to learn more about it. thank you that's great post.what about do follow and no follow in forums and blogs. What is more important. 1 way link or backlinks? I am quite confused. Thanks in advance and more power. Thanks great tips. This is a must for quality site building. These are good tips and are real methods to get listed in search engines. I have a question here: what can I do if my website loses its rank in the search engines? Should I continue to submit articles and url to directories? Does this improve my ranking there after? How if they made their blog on NoFollow? Great articles you have here. Look at the source code to find out whether the blog is dofollow or nofollow. I am a big promoter of articles and have started posting them with freetrafficsystem who then let you post these articles on up to 30 blogs which gives you massive backlink action. Hey Kranthi, what about your blog? is it a dofollow or nofollow. I heard your as a dofollow blog but from my test with a firefox plugin, i can say yours is not a dofollow blog at present.. Gardening is so relaxing and a wonderful way to spend time outdoors. It is one of my favorite hobbies that I love to share with others online! Thanks for taking the time to write this post, I always learn so much about gardening from many different sources online! The best and easiest way to get backlinks free is the directories submission. all i do is take some ~5000 Directories available online, sort them according to my requirement, and submit my site. this makes majority of the links related to the website. Cool tips. Now I'm using comment and article directories. I've to try other methods too for my blog http://cosmichealing.blogspot.com about meditation and healing. Try BackLinkStat.com - detailed backlinks report of your site for FREE! Wow... nice tips to get one way links. I have submitted my articles with ezine and got more powerful backlinks. Enjoyed all oa your tips...they are really great! Try to use social bookmarks. They get indexed quickly and google trusts these sites so these links will be valuable. Very good and knowledgeable post. Keep posting more of this kind. I was looking for such type article about one way back links for a long time. Thanks for sharing the such information with us. nice tutorial such a great helpful.Thank u.
tank you very much for your post at least you clearly stated how to get backlink is all about and thanks again. I searched for information about one way linking strategies and found this post. Having recently had phone call from a company advising me that my site was going to banned by Google as i was linking to sites that was not related to my site, I contacted my web designers. They explained that the call made some valued points, but at the same time had exaggerated the truth so that I would employ him to SEO my site. I ran some checks on the company in question and found some complaints conerning the comapany, as regarding the amount they wer charging for their SEO work. I shall try to do some of the work myself as I certainly do not have an exhaustive budget. great post,thanks for sharing it.informative and interesting.keep it up! this is a great post from an expert and thank you very much for sharing this valuable information with us.